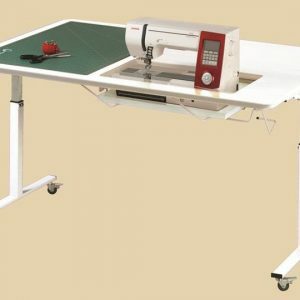 Our Quilty is made to support all large longarm quilting machines currently on the market, allowing you the comfort of sitting down while quilting. She can accommodate machines weighing up to 125 pounds. Remove your longarm from your frame, re-position your screen and place in Quilty’s large opening. Sit in front of your quilt just like you would a standard sewing machine in a cabinet. Quilty has a durable design with MDF surfaces and melamine laminate that will support machines up to 125 pounds. The 8 heavy duty casters lock in place to help reduce movement and vibration. An adjustable platform allows you to move your machine to the perfect flatbed height and is secured in place with 8 bolts. The black flap folds down when not in use to help reduce the space needed. Purchase a machine specific custom insert by visiting our Quilty Custom Insert page and providing the name brand and model number of your sewing machine. Click the Cabinet Specs for detailed cabinet dimensions, including machine opening size. The cabinet ships in 3 boxes and is assembled using a hammer, a standard screwdriver and about 1 hour of time. Click the Assembly Manuals/Videos Tab to see our YouTube Assembly Video(s) and to download the Assembly Manual. The Quilty cabinet ships in 3 boxes, weighing 185 #s, by FedEx or UPS. 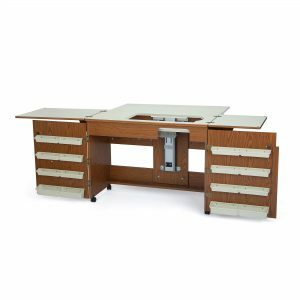 Note: The Quilty Custom Machine Insert, ordered separately, will arrive after you receive your cabinet because it can take up to 3 weeks to manufacture. The cabinet ships in 3 boxes and is assembled using a standard screwdriver and hammer in about 1 hour. Assembly instructions are included, but you can download the Assembly Manual PDF file below. The Assembly Manual PDF file is available via the link below. Right click the link and select “Save Link As” (or “Save Target As”) to immediately save this PDF manual (403KB) to your computer.